Greek Orthodox Patriarch of the Levant and Antioch Youhanna X Yazigi held a mass on Sunday at Saint Nicholas Cathedral in Ashrafieh on the occasion of his visit to the Beirut Bishopric. 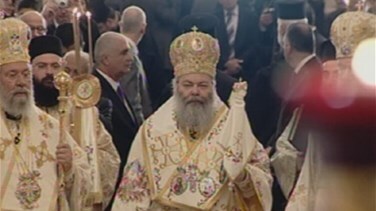 President Michel Sleiman, Prime Minister Najib Mikati and Maronite Patriarch Cardinal Beshara Boutros Rai were among several politicians and clergymen attending the mass. Throughout the homily, Patriarch Youhanna X Yazigi thanked president Sleiman and other officials for their efforts and added that the church would engage in a dialogue if it were based on mutual respect. Patriarch Yazigi said that the church will offer help for youths, women and families in light of the harsh economic and social conditions. “Muslims are partners in the nation, and our ties with them go beyond coexistence; we share with them the responsibility to build a [better] future and confront dangers,” Patriarch Yazigi said. Following the mass, Beirut Greek Orthodox Metropolitan Elias Aoudeh held a luncheon at the Bristol Hotel in honor of Patriarch Yazigi.